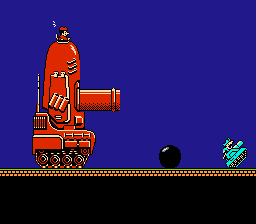 "Famicom Wars is a perfect showcase of where great modern strategy games have their roots. The title is rewarding, fun to play and challenging." Famicom Wars is the first in the long-running Nintendo Wars series, first seen outside Japan in 2001 with the release of Advance Wars for Gameboy Advance. Like Fire Emblem, it's rather strange it wasn't localized until the days of the GBA, but while that remains a mystery, this game should not. This wonderful title is well worth the import efforts. Anyone who has ever played any game in the Wars series will likely describe them as chess on a minefield: every action or inaction you perform can ultimately determine if the battle outcome will be glorious victory or crushing defeat. You assume the role of commanding officer of the Red Star army (Orange Star outside Japan) to defeat the opposing Blue Moon forces. You hate the Blue Moon army. You wage war. There isn’t really anything more to it than that. Unlike sequels, the game’s COs lack personality, dialogue, or rhyme or reason for what they’re doing. All you need to know is that this is war, and you’re in it to win. Despite the fact that the names of the armies sound like a certain magically delicious cereal, the game is incredibly deep, involved and fun to play, so the lack of any real story is forgivable. 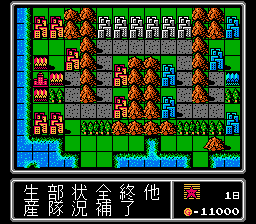 As all games in the Wars series, Famicom Wars takes place on a grid overworld with each space representing an area of land, such as cities, roads, plains, mountains, forests or seas. You navigate a variety of units across the battlefield one by one per turn. Battles are spiced up a bit by showing animation as each force attacks and counterattacks. Overall the graphics are rather simple, but the simplicity effectively helps keep the game from becoming overwhelming, and thus, enjoyable. 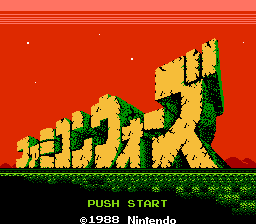 As with most classic Nintendo games, half what makes Famicom Wars so great is its memorable music. Even though the Red Star theme and Blue Moon theme are basically the only songs in the game, they are pleasant to listen to and will have you humming their themes long after you stop playing. Sound effects in the game are handled well. Bullets sound like bullets, explosions sound decent enough and the siren that whines when each player’s turn starts just adds to the feel of war the game presents. This is where the game excels. 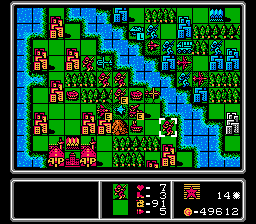 Famicom Wars is a turn-based strategy game where you build units in bases, airports and seaports. Each unit in the game has a particular purpose and weakness, so creating balanced units is important. For example, ground soldiers can capture neutral and enemy cities but are vulnerable to tank fire. Tanks can be easily destroyed by arial bombers, but bombers are no match for anti-air tanks and missiles. You must also take into consideration your war funds. It costs significantly more to manufacture large tanks than it does small tanks, so leaving units alone isn’t a good idea, as even the more powerful tanks can be taken out by a large number of weaker enemy forces. There is also a two-player option where a second player can assume the role of the Blue Moon army. 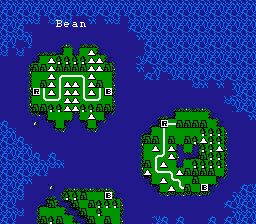 Due to the length of time battles take, however, its unlikely that either player would bother duking it out on any but Bean Island, the smallest map in the game. The controls function well. The D-pad moves the curser around the map. Pressing B brings up an options menu, giving you options to build units (only works at a base), check a list of your existing units, check a list of all other stats, supply other units (only works for transport units), end your turn, or choose other options including adjusting settings, saving and loading, and finally yielding the battle. The A button performs actions and is used to confirm selections. The Select button automatically centers on your HQ, which may be helpful for some larger maps. Start doesn’t do anything. The most frustrating aspect of this game is spending hours on a map, things suddenly turning sour and you end up losing! This game can be intense. This game can sap away hours for just one map. The CPU is vicious, and you really do feel like your waging war! It's hard to put into words just how fun moving little dudes across a map and having them beat up other little dudes can be. It’s just something you need to experience yourself. What I can say is that the complexity of the game rewards well thought out plans of attacks, and seeing the success of your careful planning is incredibly satisfying. 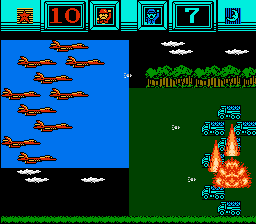 Famicom Wars is a perfect showcase of where great modern strategy games have their roots. The title is rewarding, fun to play and challenging. Navigating the Japanese menus can be a little daunting at first, but with a little experience with other games in the series such as Advance Wars, players should have no problem getting right into this.